Qty 1 Apple iPad 1st Gen. 64GB A1337 Wi-Fi AT&T 9.7in G. This tablet is USED and has been FULLY TESTED and reset to factory defaults. All buttons press properly and function as intended. The exterior surfaces, including the glass, have scuffs and scratches as a result of prior handling and use. Multitasking is easy with 512MB of Ram. This unit contains the following issues: Casing and digitizer are scratched. (PICTURE: Usually what you see in the picture is what you will get. (Why a pickup fee?. Physical condition: Good. ). The part number is MC497LL/A and model number is A1337. It will still have iOS 4 installed! Tablet shows light to moderate scratches on screen. USB charging cable, SIM Card and wall adapter not included. Tablet only. Apple iPad 1st Generation (A1337). The iPad powers up good and functions as intended. The tablet is from AT&T. 64GB - AT&T - 3G WiFi. There are no exceptions. GOOD CONDITION. IMPORTANT INFORMATION. Fully tested working and reset, ready for new user. Screen in great condition - back has a dent and minor scratched. Item Sold as is. Apple iPad 1st Generation (A1337). 64GB - WiFi 3G. FULLY FUNCTIONAL. There are no exceptions. IMPORTANT INFORMATION. Model A1337. Has a black stickers of the Beatles on the back. Up for sale is a Apple iPad! Apple iPad. Gray and black in color. At & T (will need to be hooked back up). Tablet has been tested for key functions, cleaned and then factory reset. TESTED/CLEANED & FACTORY RESET. iPAD & USB CABLE ONLY - NOTHING ELSE IS INCLUDED. Tested for key functions. We are always willing to help. All In One. Extended Warranty 1/2/3 years. Original box included. No SIM card included. Factory reset. IPad Only -- No Accessories. Fully tested and functional. You will get exactly what has been described and what the pictures show. For sale is an Apple iPad 1st Gen. This item is in good working condition and has been cleaned, tested, and factory reset. 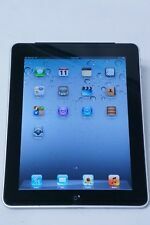 USED USED Apple iPad 1st Gen AT&T (A1337) 64GB - WiFi 3G. Condition:- This is a USED item. 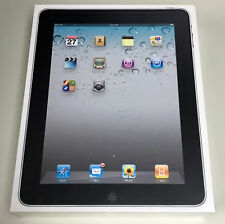 This is a USED and tested Apple iPad 1st Gen AT&T (A1337) 64GB - WiFi 3G. There may be signs of use. The screen does have a scratch. AS-IS Apple iPad A1337 iOS 1st Gen (Wi-Fi) 64GB -Wiped No iCloud Lock (V513). This item has been successfully tested for power on. Location # 7 J 3 (V513). Design By Useful Links. Line In Screen . IPad 1st Gen 64GB A1337 MC497LL Wifi 3G, AT&T, BAD ESN/BAT/MUTE SWITCH Includes iPad only. No cables, AC Adapter, cases, accessories, sim card or anything else included. Not iCloud locked. No Applecare. This item has been successfully tested for power on. Location # 7 F 3 (V553). Useful Links. (1) Wiped - Broken Screen - No iCloud Lock . (1) No Good Test - Itunes - iCloud Unknown . Sold AS-IS For Parts and/or Repair . This is sold very strictly for parts or repair only. Our priority is satisfying your need! Check out the photos. Tablet won’t power on when plugged in. · When unplugged and power button is pressed tablet shows no signs of life. · Because of the above symptoms we're ASSUMING the battery is defective. · Please note, we said ASSUMING. We're not aware of any password or Apple ID/iCloud account that may be present because the device does not boot. · Screen and back is in great condition. · They're no cracks and the overall cosmetic condition is great. · "Cosmetic condition" may be a matter of opinion so please view all the pictures carefully for your determination. · The tablet does not come with a charger or any other accessories than the Otter Box protective case shown in the pictures. IPad 1st Gen 64GB A1337 MC497LL 3G, AT&T, BAD ESN/CRACKED GLASS/BAD POWER BUTTO Includes iPad only. No cables, AC Adapter, cases, accessories, sim card or anything else included. Not iCloud locked. 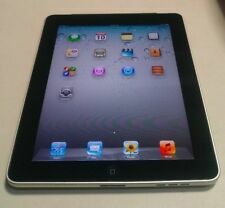 IPad 1st Gen 64GB A1337 MC497LL Wifi 3G, AT&T, BAD ESN/CRACKED GLASS/LCD SPOT Includes iPad only. No cables, AC Adapter, cases, accessories, sim card or anything else included. Not iCloud locked. We strive for excellence and appreciate the. Let us earn your loyalty! Cash is only accepted for will-calls (in-person). Our warranty excludes all consumable goods, eg. Compatibility issues are not considered DOA. Model: A1337. Apple iPad 1st Gen 64GB for Parts or Repair. Sold AS IS for parts or repair only. Minor scuffs on the back. Apple iPad WiFi A1337 64GB Tablet. Condition: Pre-owned. 5x16GB 1x32GB 7x64GB. No cables included. There is a thin crack in glass. There is a small dent on back. Tablet will not power on. There is a dent on one corner. NO SIM CARDS ARE INCLUDED WITH THIS LOT . We are unable to file any claims after this date. We strive for excellence and appreciate the. All pictures are taken in house. "The sale of this item may be subject to regulation by the U.S. Food and Drug Administration and state and local regulatory agencies. There is 1 Apple iPad 1st Generation 64GB A1337. There are 3 Apple iPad 1st Generation 16gb A1219. Also, no accessories are included except the 4 iPads. 30 Pin Connector. WI-FI 3G 2010. IPad 1st Gen 64GB A1337 MC497LL Wifi 3G, AT&T, BAD ESN/MUTE SWITCH/LCD SPOTS Includes iPad only. No cables, AC Adapter, cases, accessories, sim card or anything else included. Not iCloud locked. No Applecare. IPad 1st Gen 64GB A1337 MC497LL Wifi 3G, AT&T, BAD ESN/MUTE SWITCH Includes iPad only. No cables, AC Adapter, cases, accessories, sim card or anything else included. Not iCloud locked. No Applecare. 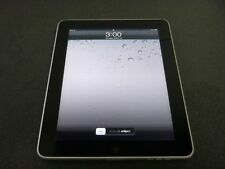 IPad 1st Gen 64GB A1337 MC497LL Wifi 3G, AT&T, BAD ESN Includes iPad only. No cables, AC Adapter, cases, accessories, sim card or anything else included. Not iCloud locked. No Applecare. Locked to the GSM carrier AT&T but has a bad ESN. IPad is in good physical condition and there are no cracks in the screen. Minor surface scratches and sticker residue. Therefore being sold AS IS for Parts or Repair. No power cord or other accessories included. IPad 1st Gen 64GB A1337 MC497B Wifi 3G, UNKNOWN CAARRIER, BAD ESN Includes iPad only. No cables, AC Adapter, cases, accessories, sim card or anything else included. Not iCloud locked. No Applecare. IPad 1st Gen 64GB A1337 MC497LL Wifi 3G, AT&T, BAD ESN CRACKED ANTENNAE CAP Includes iPad only. No cables, AC Adapter, cases, accessories, sim card or anything else included. Not iCloud locked. No Applecare. IPad 1st Gen 64GB A1337 MC497LL Wifi 3G, AT&T, BAD ESN/DISCOLORED REAR/LCD Includes iPad only. No cables, AC Adapter, cases, accessories, sim card or anything else included. Not iCloud locked. No Applecare. IPad 1st Gen 64GB A1337 MC497LL Wifi 3G, AT&T, BAD ESN/GAP Includes iPad only. No cables, AC Adapter, cases, accessories, sim card or anything else included. Not iCloud locked. No Applecare. Locked to the GSM carrier AT&T but has a bad ESN.